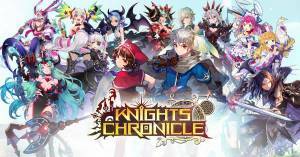 Knights Chronicle is a free-to-play mobile game by developer Netmarble which is available in both the AppStore and Google Play. The game boasts a wide variety of interesting characters, with their own unique set of Skills, quirks, and design. As the title implies, this is the game’s core objective - to collect and train the most powerful knights or characters so you can use them to tackle dungeons or dominate in PVP. While it’s easy to mistake it as another JPRG-inspired mobile game, there’s no manual exploration or dungeon crawling; everything is selected and launched from the user Interface. The game mechanics are really easy to grasp, making it quite easy to get accustomed to even after only a day or two of playing it. It’s also generous enough to ensure players don’t get hindered by annoying paywalls or pay-to-win mechanics. Dedicated “free” players will find interest with the content the game has to offer since almost all of the best features of the game is accessible albeit may require a bit of grinding and of course, waiting. Welcome to Supercheats’ unofficial guide for the game! We will be covering most of the fundamental aspects of the game and feature some sort of character tier list. It will be almost impossible for us to feature and review all the characters in the game since getting them heavily relies on luck (and tons of cash if you’re willing to splurge). However, we will be doing our own research and compilation from other available sources and complement it with what we have on hand. Please use the menu on the right to navigate. No discussions open for Knights Chronicle at the moment.